“Black Rose” is an incline of the emotional spiral of love. Tyrese has captured the wavy ribbon of love with all of its wind-blown loops, knots and flutters. We are pulled into this musical visual from the start with the sound of the “koto” and foreplay with “Addicted”, which stirs the sensation of playful anticipation. Tyrese’s vocal ranges, entwined with the instrumental arrangements allows for the depth, of each song to be explored from its essence. Which, provides insight into the emotional struggles he mentioned, he encountered during the creative process of “Black Rose”. With “Black Rose” soon to be burning the air waves, R & B differently is not “dead”. Baby making music is alive and well! Within six weeks the single “Shame” has reached #1 on Billboard, currently holds the #1 and #8 on itunes and, the album holds the #1 spot on Billboard 200, #1 album in the country on 9 different charts and #1 in 15 countries. In show of support, fans are purchasing the album as fast as it hits the store. “The Black Rose Mission”, is full swing. 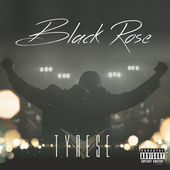 Check out Tyrese speaking with “The Breakfast Club about, “Black Rose” being his last album.” Then indulge in the “Black Rose Experience“.